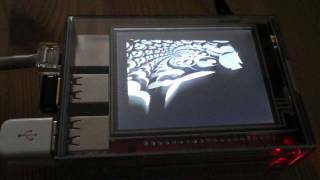 Rasberry Pi Projection Mapping addon for openFrameworks. This project is an attempt to create optimized version of an openFrameworks projection mapping addon for the Raspberry Pi. It is also my master thesis project at Aalto University, School of Arts, Design and Architecture (Helsinki Media Lab). ofxPiMapper is mainly for people who want to use the Raspberry Pi as a cheaper way to create standalone mapping installations. Let’s say someone has 10 generative mapping pieces and gets an offer to exhibit them in an art gallery, museum or any other kind of place. 10 expensive computers? No! PiMapper is here to save you! ofxPiMapper features FBO sources that allow you to create generative openFrameworks patches to be used with ofxPiMapper. Extend the FboSource class, override setup(), update() and draw()methods and then create an instance of your custom source to add it to your ofxPiMapper object. Since version 0.2.0 ofxPiMapper supports video sources and since version 0.2.3 ofxPiMapper supports undo.